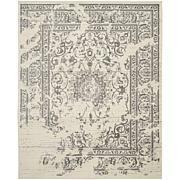 1'9" x 2'9" 2'6" x 4' 3'6" x 5'6" 8' x 10'6"
This area rug features contemporary and transitional designs, meticulously crafted with high-density, hand-hooked yarns. Matching hues and subtle shades of color set the mood for any space. 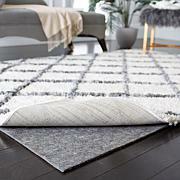 The vivid colors in the little rug are perfect, matching any of the colors depicted, So very versatile. 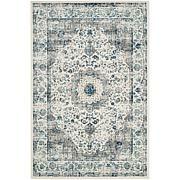 It is not stated in the description that this rug has a jute back so it will slip on tile floors- rug pad is necessary. 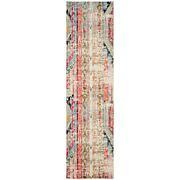 Also, I did not know there was no mailing label ($10.95) to return this rug, so I had to pay $17 to return it! I purchased the small size. I thought all items offered a return label (with amount of shipping deducted from return amount) but I guess for heavier items, that is not the case!